In selecting a facility for surgery, you will want the comfort that comes with knowing you are being cared for at the most respected outpatient surgery center in the Tri-State: the Evansville Surgery Center. Evansville Surgery Center was awarded the 2013-2014 Voyance National APEX Quality Award. This award recognizes outstanding healthcare organizations that have demonstrated the highest level of excellence in patient satisfaction and overall care over the preceding 12 months. Providers are recognized as best-in-class performers based on patient feedback provided during a 12-month period. Award criteria emphasizes patient-reported measures that have the highest correlation to behaviors that promote effective care as opposed to those being purely experiential. All of our anesthesiologists are certified by the American Board of Anesthesiology. Click here to learn more about our team! HFAP accreditation is recognized nationwide as a symbol of quality. It reflects our organization’s commitment to excellence. Our staff members have been carefully selected for their extensive experience, advanced training, and dedication. They take a personal interest in you before, during, and after your surgery. Our locations are easily accessible. Our admission process is streamlined. In most cases, you will only be required to arrive one to two hours before your procedure. 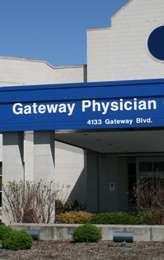 The Evansville Surgery Center is a preferred provider for most health insurance carriers. State-of-the-art technology and precision instrumentation are always available at the Evansville Surgery Center. Because of the complexity of your procedure, you may require an extended recovery. Our comfortable overnight suites are tastefully decorated, and include private baths. You will be reassured to know that your nurse is just a step away. We offer a full spectrum of surgical services for women. Because of our friendly, caring staff and the less intimidating nature of our facility, children are more comfortable at the Evansville Surgery Center. The way you feel about your care is important to us. Listen to what some of our patients have to say!